Good Wine Under $20: Spring. It's Spelled SB. sounds nice and as you stated I usually don't associate Burgundy with Sauv. Blanc varietal and usually turn to Sancerre for French versions. I will have to try this, it sounds very yummy and at a great price to boot. Thanks for the veggie friendly recipe as well. This is fine Sauvignon. I've had it and their Aligoté too. Both are wonderful examples. But neither one is typical as these winemakers seem to me to be devotees of terroir more than style. 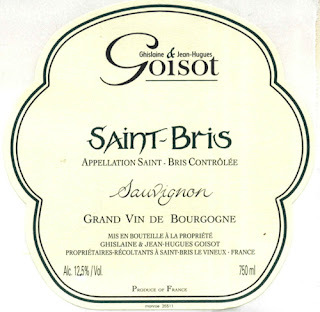 Would love to try their whole line of St-Bris wines sometime. As for your inclusive words that reach out to readers whose spring is still far off, I thank you. Since I've got a ticket to SoCal soon, I thank your state too.